This New Year's Eve should you stay cozy at home by the fire or head into the heat of the action? Find out now! There are no right or wrong answers in this quiz, so just choose the answer that jumps out at you. Of course, you can take as much time as you like. There's no pressure and no stress. Just party! Where will you have the most fun this New Year's Eve? Will it be a quiet night in or a wild night out? 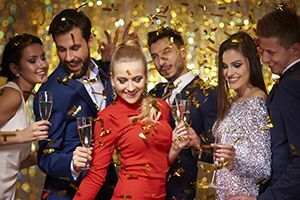 Take our fun quiz to find your perfect party place for New Year's Eve! Play now!